There's no such thing as the perfect dog (it would be boring) but most rescue dogs have issues, even if its just the fact that, for whatever reason, they've been abandoned. They could be from a dog pound or a private home but to them they are being moved on yet again when they go to their new home. Something Olwyn understood and was prepared for when she adopted Gwen just over six months. Gwen came iin to the Trust a year ago as a thin little waif, she responded well to her lead training and did try to be clean in her pen but she was an anxious little girl. 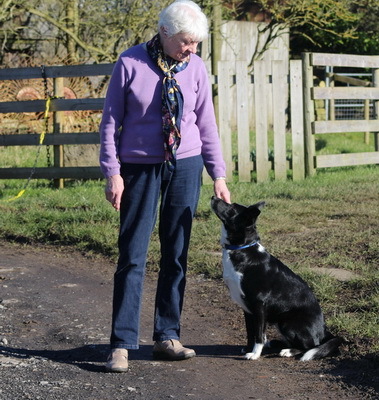 In the six months that Olwyn has had Gwen in her life she has been patient, taught her how to be with other dogs, praised her for being good with people and patiently mopped up after her. It has taken six months and they now have a brilliant relationship but even Olwyn says they still have a way to go and things to learn. When she came back for a visit we took this lovely photo of them both as a reminder to us that it's worth explaining to people how long it takes and to be there for back up if needed, and to potential adopters that it takes time and patience and that at least six months or a year will pass before you have the dog that is perfect for you but it is so so worth it.